AS chairman of Melville Neighbourhood Watch, Winthrop resident Atul Garg is a familiar face around the City. 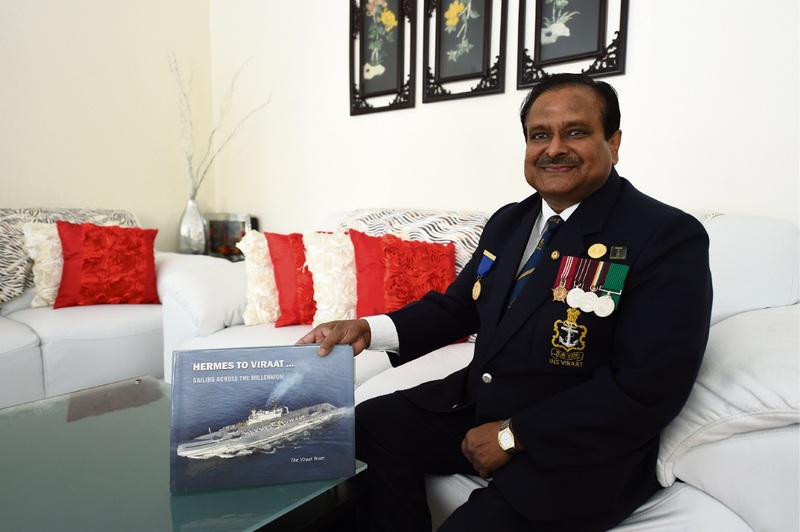 What many might not know is that before immigrating to Australia in 1993, Mr Garg enjoyed a long and decorated career with the Indian Navy – including playing a major role in the commissioning of aircraft carrier INS Viraat in 1987. Mr Garg joined the navy as a cadet in 1970 and was commissioned as a sub-|lieutenant four years later. The Indian Navy purchased the aircraft carrier INS Viraat (formally HMS Hermes) from the UK in April 1986 after the conclusion of the Falklands War, where it had served as the flagship of the British forces. Originally built in the 1950s, the INS Viraat required an extensive refit, including the installation of new fire control equipment, navigation radars, improved nuclear, biological and chemical protection and deck landing aids. Mr Garg was a member of the vessel’s commissioning crew and the chief aviation electrical engineer on board. “I was responsible for supervising installation of new avionics workshop equipment, flight deck and hangar deck equipment, and maintenance of Sea Harrier, Seaking and Chetak aircraft squadrons,” he said. “One of my most important contributions was the installation of the world’s first local area network (LAN) on a sailing ship in 1987. “The LAN allowed the ship to connect all departments and operational areas together and assisted flying operations by performing programmed calculations of Sea Harrier data, true wind and flying course. He also wrote the ship’s song, which was regularly broadcast at meal times and on official functions such as parades. Most ships have a song to encourage camaraderie and boost morale among the ship’s company. Mr Garg, by then a Commander, retired from the navy in 1993 and migrated to Australia in pursuit of a better life and future for his wife and children. Since then he has worked in engineering management, most recently spending the past six years as a senior energy specialist at Fortescue Metals Group. “I have always been a strong believer in community safety and security through crime prevention and so I joined Neighbourhood Watch 22 years ago in 1995 as a street representative and have been the chairman of the City of Melville team since 2008,” he said. Earlier this year, Mr Garg was invited back to India for various events associated with the decommissioning of INS Viraat. “Meeting old colleagues was priceless and being back on board the aircraft carrier was extremely nostalgic,” he said.